Galbraith is bringing to the market Amble Cottage in the Scottish Borders, a modern rural property currently used as a holiday home in a beautiful part of the country. The cottage has a B rating for energy efficiency due to its biomass central heating system and solar panels. Amble Cottage is part of a small courtyard development built with energy efficiency very much in mind. The purchaser can look forward to low utility bills and a home that offers bright, very well-presented contemporary accommodation. Surrounded by an area of outstanding natural beauty, there are lovely hill walks, cycling routes and other outdoor pursuits on offer in the immediate vicinity. This would make an ideal main residence but could also be used as a second home, with great pleasure. It is unusual for a rural property to have such a high energy performance. The building firm who converted the steading had the foresight to consider which attributes would most appeal to a modern purchaser and to ensure the cottage exceeds the minimum energy efficiency standards by some margin. 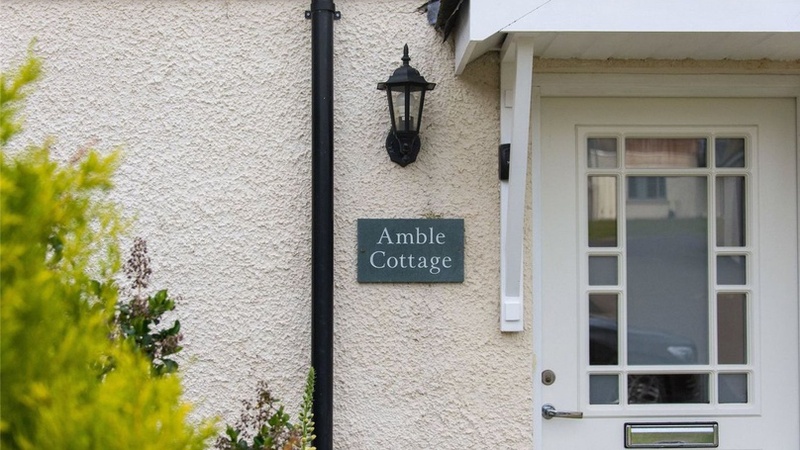 Amble Cottage provides nicely proportioned and well-appointed accommodation including two double bedrooms, one bathroom and one en-suite shower room, a lovely sitting room and contemporary dining kitchen with wooden flooring. Smart oak finishes and oak doors feature in several of the rooms. There is a low maintenance garden in front of the cottage and two private car parking spaces. Pleasants Steading is a small residential development situated close to a minor public road linking Oxnam with Jedburgh. There are local amenities in Oxnam, one mile away, with a wide range of facilities in Jedburgh, including shops, recreational facilities and a doctor’s surgery. A new primary and secondary school is under construction in Jedburgh. The Scottish Borders is known for its desirable market towns, with attractive traditional architecture and fascinating history. The beauty of the surrounding countryside belies the fact that most parts of the Scottish Borders are within easy reach of Edinburgh. Demand for property in the Scottish Borders has been boosted by improved transport links including regular train services to Edinburgh from Tweedbank. Galbraith is selling Amble Cottage for a guide price of £165,000. Our highly experienced Estate Agency team sell town and country homes, farms and estates in Kelso and the surrounding area.